Cellufine Ion Exchangers are based on spherical particles manufactured from crosslinked cellulose. Each offers excellent flow properties, mechanical stability and chemical resistance. These ion exchangers are ideally suited for both laboratory and process scale chromatography of proteins, peptides and other biomolecules. Applications include the purification of antibodies, growth factors, albumin, enzymes, nucleic acids, etc. Cellufine A-200　> Reference　> MSDS / Technical Information　> Catalog No. Cellufine A-500　> Reference　> MSDS / Technical Information　> Catalog No. Cellufine A-800　> Reference　> MSDS / Technical Information　> Catalog No. Cellufine C-500　> Reference　> MSDS / Technical Information　> Catalog No. 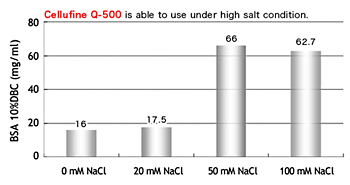 Cellufine Q-500　> Reference　> MSDS / Technical Information　> Catalog No. Cellufine S-500　> Reference　> MSDS / Technical Information　> Catalog No. Pressure flow curves for Cellufine Ion Exchangers in laboratory and process scale columns. 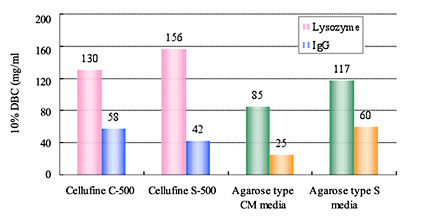 Cellufine Ion Exchangers are semi-rigid due to the crosslinked structure which gives high mechanical resistance and results in two advantages; no generation of fines during the preparation of the column and higher operating bed height without concern of bed collapse common to many soft gels. 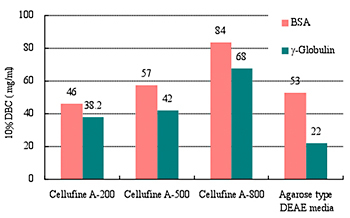 Cellufine is chemically stable. The media can be washed with a variety of solutions and shows no loss in capacity, resolution or flow rates.